The issues regarding the current Roger Goodell contract negotiations have been well documented over the past few months. From problems stemming from power over the league to the notable grievances Cowboys owner Jerry Jones has brought up throughout the process, the efforts towards a deal have not been without a lot of public mud throwing. However, a deal is still expected to be reached during or right before the Owners Meeting kick off in Dallas on December 13, according to sources talking to Adam Schefter of ESPN.com. Schefter also adds that attempts to delay the contract agreement has dissipated “meaningfully”, according to one league source. There’s always been a belief that ultimately both sides would agree on the terms, it was more of a question of when those final talks would take place. The insider relays that Goodell is expected to be paid up to $40 MM a year from 2019-2023 if all his bonuses come to fruition. This would make the commissioner a whopping $200 MM if these reported numbers are correct. The reported base salary would still be in the single-digit million dollar range, but his extra compensation would push his pay up to those higher-end rates. It remains to be seen what type of impact this public dispute will have on Goodell’s power in terms of moving forward even after a deal is reached, but that’s probably a separate issue for the commissioner who’s looking to maintain his hold on the league for another five years. Schefter also passed along that the NFL sent out a league-wide email last week reminding teams of new anti-tampering rules in regards to general manager interviews. The new rules allow for less strict guidelines for potential interviews for candidates on opposing teams. Schefter notes that one of the changes allows for teams to interview people even if they have control of their current team’s 53 man roster during the interview process. A anonymous NFL executive told Schefter that the new rules will have a “big impact” on front office movement during the offseason. While fans are used to seeing team personnel changes every year, this new adjustment should increase the amount of rumors that swirl in terms of what front office executives will be coming and going from franchises across the league. Today, the NFL and the Mexico Ministry of Tourism announced a new deal that will keep the league playing in Mexico from 2019-2021. The NFL’s Vice President of Football Communications Michael Signora posted a tweet of the agreement, which states that there will be a regular season game played in Mexico City for the next three years after the current contract ends next season. The move clearly indicates that the league is still looking to maintain and even gain more of a presence internationally. The Raiders have played in both contests in Mexico so far, so you would think that the NFL will continue to give international fans a chance to keep seeing them even after they relocate to Las Vegas. In NFLPA news, a former challenger of current head of the union DeMaurice Smith, attorney Cyrus Mehri is being open about his concerns with how the organization is being run. Apparently, Mehri sent a report to players across the league accusing Smith of spending “excessive” amounts of money on legal fees in order to fight off challengers, including himself, according to Mark Maske of the Washington Post. Maske reports that the remarks from Mehri stated that the Players Union spent over $113 MM in legal fees when a league like the NBA was only spending about $1.5 MM in a similar amount of time. While Smith did end up holding onto his current job, this news opens up questions about some of the inner workings of the union under the control of Smith. We’ll see what defense the NFLPA comes out with because they have yet to comment on this situation and they will likely need to address these shady reports if Smith hopes to stand on firmer ground with his players in the months to come. 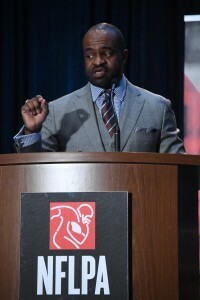 The NFLPA decided to retain executive director DeMaurice Smith, amending the union’s constitution from holding another election. Smith attained the job in 2009 and won elections in 2012 and 2015. This week’s unanimous vote — one featuring Richard Sherman, Adam Vinatieri, Dolphins long snapper John Denney and free agent center Ryan Wendell as four of the 14 voters — put the kibosh on Cyrus Mehri‘s hopes of challenging Smith in a 2018 election. The Boston Globe’s Ben Volin reports Mehri wrote a letter to NFLPA president Eric Winston and the executive committee Thursday indicating he still intends to press the league’s 32 player reps for a formal spring election. The co-founder of the Fritz Pollard Alliance that brought the Rooney Rule to the league, the 56-year-old Mehri told Volin the NFLPA didn’t post the new constitution on its website until August. Upon informing Winston at an August dinner about his plans to challenge Smith for the post, the would-be challenger didn’t come away pleased with the response. Winston said Mehri “didn’t do his homework” about the changes, instead making his pursuit like a public campaign. The NFLPA, per Volin, did not want another “free-for-all” like what occurred in 2015, when Smith fended off eight others vying for the executive director job. This led to the 14-member vote this week. Mehri has already approached player reps about his crusade. Winston said earlier this week having full-on elections every three years would not be a good look for the union. Mehri appears to disagree. “I started talking to player reps, and a couple of things happened — they uniformly are in favor of competition, uniformly they feel I’m a legitimate candidate, and uniformly none of them remember signing off on changing the constitution,” Mehri said. “Which they must have done, but must have done in such a trickery way that they didn’t know what they were signing on to. NFLPA executive director DeMaurice Smith received a unanimous vote of confidence in being extended earlier this week. Smith’s term will run through at least 2021 and possibly longer. That year looms as a critical year for the NFLPA since the current CBA expires after the 2020 season. NFLPA president Eric Winston discussed the decision to keep Smith in his current post, rather than open that position up to an outside challenger in March. “Is that the way Apple does it?” the recently released tackle said of the prospect of a full-scale election process (via Mike Florio of Pro Football Talk). “Does Apple open up for their CEO spot? Does Tim Cook have to run against someone every three years? Does the Commissioner run against someone? Is that how the NFL does business? I think that’s silly. Smith has served in this post since March 2009 and led the way toward hammering out the current CBA on which the league’s operating. He will now have a chance to negotiate the next one and has already proclaimed the ensuing agreement won’t be completed without a “significant” work stoppage. Cyrus Mehri emerged as a top potential challenger to Smith, but the 14 members of the selection committee did not end up allowing him to make a legitimate push. As for if Smith had any role in manipulating the process to make sure it was harder to replace him? Winston shot that down quickly. “I think it’s a slap in the face when you start talking about that because … I can tell you De Smith has nothing to do with the resolution process,” Winston said. “He’s in the back, he offers his opinion when he’s asked and that’s it. The board, the executive committee, and the guys run the resolution process. Lawyer Cyrus Mehri wants to dethrone DeMaurice Smith as the head of the NFL Players’ Association. If elected, he says revamping the league’s discipline policy will be one of the first items on his agenda to be tackled. NFL players are anxious for the day that their contracts will be fully guaranteed, as Dave Campbell of The Associated Press writes. “When you think about what we do for our organizations, the injuries and the pounding that we take, you would think that there would be more appreciation for your players,” Saints running back Adrian Peterson said. “It’s just so unfortunate when you think about the physicality and the toll that football takes on your body.” Naturally, this will be another major focal point for the NFLPA in its next round of CBA talks with the league. It’s hard to imagine players getting fully guaranteed deals, but it’s possible that they could have some improved injury protection. DeMaurice Smith says he wants to stay on as NFLPA chief beyond his current term. Apparently, he’ll have to fight to keep his position. Civil rights lawyer Cyrus Mehri tells HBO’s Bryant Gumbel that he will challenge Smith for leadership of the union in March 2018. Mehri clearly has a bone to pick with Smith and he won’t be shy about highlighting his own strength’s over what he perceives to be weaknesses of Smith’s. There’s no indication that players are unhappy with Smith, so Mehri may be fighting an uphill battle as he attempts his takeover. The current collective bargaining agreement expires in early 2021.